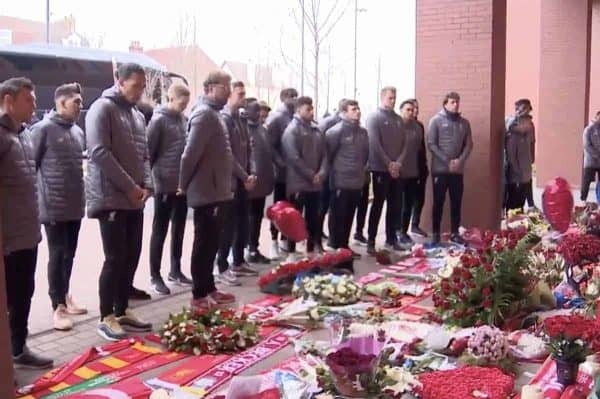 Jurgen Klopp and the Liverpool squad attended Anfield’s Hillsborough memorial on Monday morning to honour the 96 on the 30th anniversary of the disaster. On April 15, 1989, events unfolded at the Hillsborough Stadium in Sheffield that led to the unlawful killing of 96 supporters, in the worst tragedy of its kind in British sporting history. This date is an emotional one for all involved at Liverpool, and Anfield held a minute’s silence ahead of Sunday’s meeting with Chelsea to pay respect. Another will be held at 3.06pm across the city, with St George’s Hall adorned with banners of the faces of the 96, along with flowers and lanterns honouring those who lost their lives. “Never forgotten. On our minds and in our hearts. Rest in peace, the Liverpool FC first-team squad,” the card attached read. The seniors took in a period of reflection, before Neil Critchley and the academy squad followed suit, with George Johnston leading his team-mates to the memorial. And then Liverpool FC Women’s manager Vicky Jepson and her players laid their own wreath, bowing their heads in a mark of respect to the 96. Flags are being flown at half mast at Anfield on Monday, while the Kop is open between 1pm and 4pm for those wishing to sit and reflect—however, tickets must have been obtained in advance. The Liverpool Cathedral will hold a half-hour service at 2.45pm, before joining the minute’s silence at 3.06pm.